DCCoI is the national agency in Ireland for the commercial development of Irish designers and makers, stimulating innovation, championing design thinking and informing Government policy. Their vision is that Ireland be recognised and valued for its culture of design and craft. DCCoI’s “standard operating procedure” is that it wants client enterprises to give them feedback and to inform DCCoI of positive experiences and difficulties that arise. This is reflected in their website that lists a specific “feedback@” email address to be used. The website also invites clients to provide that feedback to particular functions within DCCoI – and that the Head of the relevant function will then reply. But DCCoI were not satisfied passively awaiting feedback and then reacting to it. That approach was deemed necessary but insufficient. DCCoI also considered it important to consult its clients regularly to obtain constructive feedback. DCCoI wanted to take things to that next level – to go out and proactively ask clients for their feedback. Gather broad and deep knowledge of clients’ enterprises so as to be better positioned to help them at an individual level. Ensure that the development of Programmes reflected the evolving needs of the clients. Another important goal in gathering this information from client enterprises was to be able to provide a detailed and evidence-based report to DCCoI’s funders – Enterprise Ireland and the Department of Business, Enterprise and Innovation. To ensure objectivity, clarity of purpose, and specialist expertise, DCCoI commissioned SurveyGuru to carry out this research. SurveyGuru devised a client questionnaire in partnership with DCCoI. The questionnaire was then further refined prior to its deployment by having it reviewed by a small number of pilots. Feedback from the pilots helped tweak the questionnaire to ensure its clarity (from the perspective of respondents). This design process also ensured that the survey asked all it needed to ask but no more than that. SurveyGuru then reached out to DCCoI’s clients using a combination of telephone and an online survey. The clients were able to choose how to answer the questionnaire – by phone or online. This combination of methodologies was chosen so as to cater to the clients’ preferences. 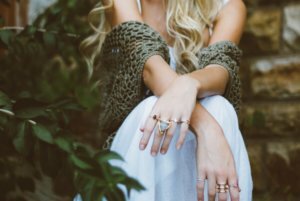 This combination of techniques elicited answers from nearly 82% of client enterprises – a very high response rate. After data collection was complete, SurveyGuru analysed the quantitative and qualitative results and presented the results electronically and in person to DCCoI. This was not a survey that simply aggregated answers into a series of academic statistics. Instead, this research was deliberately carried out in a non-anonymous manner so that DCCoI would be able to respond to the particular concerns, requests and suggestions that were received from a large number of clients. The information gathered also provided DCCoI with a detailed and representative picture of its clients, for example, how they’re doing commercially, the extent to which they’re using ecommerce, how the prospect of Brexit is affecting and concerning them, the extent of their exports, etc. This raw material has empowered DCCoI to better serve its clients – to adapt and customise its interventions to reflect the needs of particular clients. 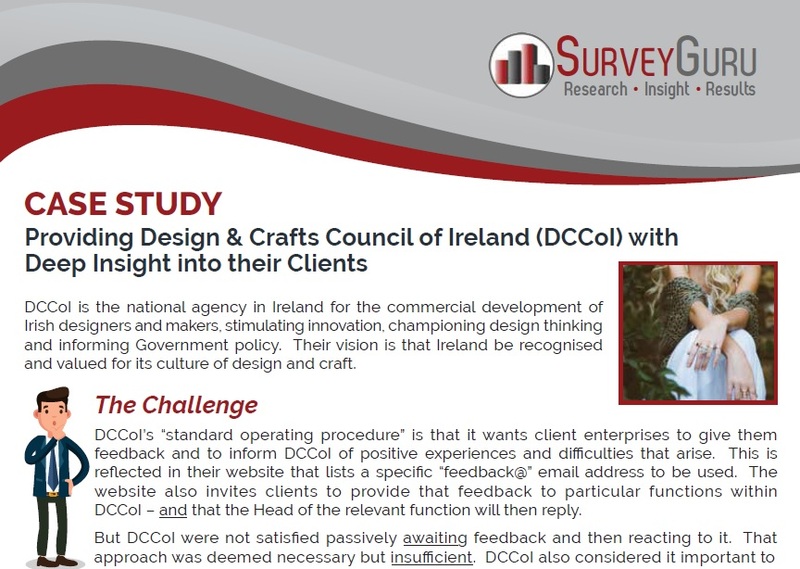 Overall DCCoI got the view of its client landscape that it was looking for. This has allowed DCCoI to make business decisions regarding those client enterprises and also to adapt its Programme Development to reflect the needs and profiles of those clients.